Successful deployment of five "BIRDS project" CubeSats from the "Kibo"
On July 7, 2017, from 5:45 p.m. - 6:30 p.m. , a total of five "BIRDS project" CubeSats were successfully deployed from the Japanese Experiment Module "Kibo". The Joint Global Multi-Nation Birds Satellite project acronym as "BIRDS project" is a international joint development and operations project of CubeSats. Kyushu Institute of Technology, Japan and Asian-African Nations are participated this project. These five CubeSats are first round of project and called BIRDS 1. 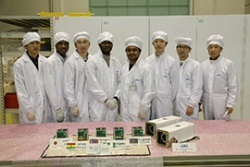 At the Tsukuba Space Center (TKSC), the personnel concerned of this project or countries are monitored and applauded the successful deployment. 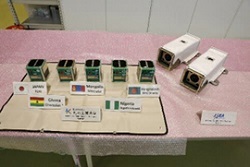 These five BIRDS project CubeSats were launched on Jun 4, 2017 aboard the Dragon CRS-11 (SpX-11) and prepared for pre-deployment works such as setting up of JEM Small Satellite Orbital Deployer (J-SSOD) in the "Kibo" module. CubeSat is a microsatellite whose basic size is 10 cubic cm (called 1U), with 2U (20 cm in height) and 3U (30 cm in height) sizes also being available. JAXA's J-SSOD was made in compliance with the CubeSat specification and can deploy a total of 12U at one deployment opportunity. In the near future, the deployment capacity of J-SSOD will be upgraded up to 48U.